Fifty people were killed in shooting attacks during Friday prayers at two mosques in Christchurch, New Zealand. Thirty people are receiving treatment in hospitals, and nine are in a critical condition in intensive care. The ages of the dead range from 3 to 77. Two children have died. The suspected shooter, 28-year-old Australian Brenton Tarrant, appeared in court charged with murder. It is now illegal for anyone in New Zealand to view, possess or distribute the video of the Christchurch attacks in any form, including via social media platforms. Prime Minister Jacinda Ardern has repeatedly called on social media platforms to take more responsibility after it was revealed 1.5 million videos of the Christchurch attacks were removed from Facebook in the first 24 hours. Facebook has responded by claiming the original live broadcast was watched fewer than 200 times. "Love each other, spread love, take care of each other": children in Christchurch have gathered together to support the Muslim community. Facebook's VP and deputy general counsel Chris Sonderby has released a statement claiming the video of the mosque attacks was watched fewer than 200 times when it was live streamed. "No users reported the video during the live broadcast. Including the views during the live broadcast, the video was viewed about 4000 times in total before being removed from Facebook," Sonderby said. The statement says the first Facebook user reported the original video 29 minutes after it started and 12 minutes after the live broadcast ended. Facebook says that before it was alerted to the video, a user on 8chan posted a link to a copy of the video on a file-sharing site. "We removed the original Facebook Live video and hashed it so that other shares that are visually similar to that video are then detected and automatically removed from Facebook and Instagram," Sonderby said. The personal accounts of the named suspect were removed from Facebook and Instagram and "imposter accounts" are being removed. Facebook also said it has provided "on-the-ground resource" for law enforcement authorities in New Zealand. More than 800 "visually-distinct videos" related to the attack have been shared via the collective database of the Global Internet Forum to Counter Terrorism (GIFCT). Prime minister Jacinda Ardern has repeated her calls for social media platforms to take responsibility for what they allow to be published. Ardern also vowed never to refer to the alleged killer by name, and urged people to instead “speak the names of those who were lost”. The Association of New Zealand Advertisers and the Commercial Communications Council have released a joint statement calling on Facebook and other social media platforms to immediately take steps to effectively moderate hate content "before another tragedy can be streamed online". "Advertising funds social media. Businesses are already asking if they wish to be associated with social media platforms unable or unwilling to take responsibility for content on those sites," the statement said. "The events in Christchurch raise the question, if the site owners can target consumers with advertising in microseconds, why can’t the same technology be applied to prevent this kind of content being streamed live? "ANZA and the Comms Council encourage all advertisers to recognise they have choice where their advertising dollars are spent, and carefully consider, with their agency partners, where their ads appear." "Love each other, spread love, take care of each other, because that’s what the world needs right now"
Last night, Christchurch's schoolchildren came together for a large vigil in honour of the victims of Friday's terror attack. Bearing candles, flowers and paper chains, the city's students spoke to BuzzFeed News about their experiences and what the community now needs. “We want to show our pride and our culture and our respect to the people that have passed," Heneli, from St Thomas of Canterbury College, said. “We’re all one here in New Zealand. No-one’s different, no-one’s better than others, we’re equal." Luvena said: “I think New Zealand should be a symbol for everyone in the world — that we should change what we’re doing and get our humanity back." It is illegal for anyone in New Zealand to view, possess or distribute the video of the Christchurch attacks in any form, including via social media platforms, the country's chief censor David Shanks has announced. “We’re aware that for a time after the attacks, this video was widely available on social media and many New Zealanders saw it, sometimes without meaning to," he said. “It's important people are now clear they should not view, download or share the video." A statement from the Office of Film & Literature Classification said the priority now was to mitigate the harm caused by the material to the New Zealand public, in particular the families and loved ones of those who lost their lives in the terror attacks. The alleged gunman's "manifesto" document is also being examined by the chief censor. As many as 50 companies are reported to be considering removing their adverts from Facebook in the wake of the Christchurch attacks. The social media platform has attracted considerable criticism, including from the New Zealand prime minister, over the fact video footage of the attacks was available on Facebook. The company revealed 1.5 million videos were removed within the first 24 hours. UPDATE Tuesday 10am: A community-driven event is planned for Nth Hagley Park this Saturday. The Christchurch March for Love is planned for 10am. The Remember Those Who Lost Their Lives 15-3-19 vigil will be held in Nth Hagley Park on Sunday night between 5 -7pm. New Zealand prime minister Jacinda Ardern has spoken to the media on Tuesday morning. Ardern said it was "horrendous" that the video of last week's attacks still exists on Facebook, the New Zealand Herald reported. The PM said her government had been in contact with the social network, adding: "The responsibility sits with them". On the reports the alleged gunman will seek to represent himself during in court, Ardern said: "That is absolutely something that we need to acknowledge and do what we can to prevent the notoriety that this individual seeks. "You won't hear me speak his name." "Horrific act committed by one person"
New Zealand police commissioner Mike Bush has said the investigation into the Christchurch terror attacks now involves the largest number of detectives and specialists the force has ever deployed. There are 250 officers and support staff involved. Bush said the investigation involves staff from the FBI and Australian Federal Police on the ground in New Zealand, as well as investigators assisting in Australian states. "There is no indication at this stage that anyone else was directly involved in the attack — we believe this horrific act was committed by one person," he said in a statement. He said the national threat level remains high and a visible police presence will continue. "This is precautionary and for the safety and reassurance of everyone." Ardern was asked further questions about the fact the shootings were live-streamed over Facebook. “The point I'd like to make, though, is obviously there's been a proliferation of [the video’s] availability. 1.5 million times. The fact that only 1.2 million of those times has been automated tells me there are powers to take a very direct approach to instances of speech that incites violence or that incites hate,” she said. Arden revealed on Sunday that Facebook’s chief operating officer Sheryl Sandberg had “reached out”. “They've acknowledged some of the systems they already have around what they term hate speech,” Ardern said on Monday. Ardern said cabinet had agreed to launch an inquiry into the terror attack. “The purpose of this inquiry is to look at what all relevant agencies knew, or could or should have known, about the individual and his activities including his access to weapons and whether they should have been in a position to prevent the attack,” she said. New Zealand prime minister Jacinda Ardern says the nation’s parliamentary cabinet has made “in principle decisions” to reform gun laws following the mass shootings in Christchurch. "We have made a decision as a cabinet, we are unified," Ardern told reporters at a press conference on Monday afternoon. She said details of the decision will be released to the media and public before cabinet meets again next week. Ardern said she acknowledged that for a “short period” there would be a “degree of uncertainty” for gun owners, including those who possess weapons for “legitimate reasons”. Ardern said if New Zealanders were considering surrendering a gun she would encourage them to do so. Ardern said she thought it was “incredible” that the cabinet had been able to bring together information needed to make the “in principle decision” so quickly and now it was time to iron out the details. When asked if she would consider a buyback scheme, Ardern acknowledged that Australia undertook one [after the Port Arthur massacre in 1996] and said these were the kinds of questions that added “complexity to issues around gun control law changes and management”. She said she was unable to say whether there would be a moratorium on gun sales in the meantime. The owner of a New Zealand gun shop has confirmed that his store sold four firearms and ammunition to the alleged perpetrator of a massacre at two Christchurch mosques on Friday. David Tipple, the owner and managing director of Gun City, said at a press conference on Monday that the man had purchased four "A Category" firearms and ammunition from its online store in three or four separate orders between the end of 2017 and March 2018. However, the man did not buy his military-style semiautomatic weapon, also known as an assault weapon, from Gun City, Tipple said. "I watched the video [of the attacks], I saw the rifle ... and it was not from any Gun City-affiliated store," he added. David Meates, chief executive of Canterbury District Health Board, has provided an update on the injured receiving care at Christchurch Hospital. Thirty-one people are still receiving treatment, and nine are in a critical condition in intensive care. The father of a 4-year-old girl in a critical condition in Starship Hospital has also been transferred to Auckland and remains in a serious but stable condition. As the majority of us return to work and school today, it’s probably more important than ever that we connect, share our thoughts and experiences, and help each other process what has happened. Spend time with people you love and talk about how you’re feeling. Consider taking a digital detox and take a break from social media. Instead, focus on an activity you love or on the people around you. Look after yourself and those around you and remember that people cope in different ways. Disasters and tragedies take their toll and our resilient Canterbury people have been through much in recent times. For some that may make things easier because of the coping skills they have learnt, but for others it may bring back unwelcome feelings or add to their anxiety. Feeling on edge and upset right now is a completely normal reaction. Recovery is a marathon, not a sprint, so allow yourselves time and be kind to yourself and others — a simple kind act or generosity of spirit and the support you give others might come at just the right time to make all the difference to them. Friends of a missing man grieve in Christchurch. An 18-year-old man who allegedly published a photograph of the Al Noor mosque with the message “target acquired” in the days before a deadly shooting unfolded there has been denied bail in the Christchurch District Court. The man, whose name is suppressed, has been charged with two offences under the New Zealand Films, Videos and Publications Classifications Act 1993: making an objectionable publication and distributing an objectionable publication. Each offence carries a maximum prison term of 14 years. Court documents allege the man published a photograph of the Deans Avenue mosque in Christchurch with the message “target acquired”, and further chat messaging around “inciting extreme violence” between March 8 and15. They also allege he distributed a livestream that showed the murder of multiple people at the Al Noor mosque on March 15. Judge Stephen O’Driscoll ordered people in the public gallery to leave court during the hearing but allowed accredited media to remain inside. His reasons for denying bail and the submissions from lawyers in court cannot be reported for legal reasons. The 18-year-old's next court appearance is on April 8. All gun owners in New Zealand must have a licence that requires a background check taking into account the person's criminal record, history of violence and drug and alcohol use, and a firearms safety course. Trade Me said on Monday that it is halting the sale of semiautomatic weapons on its platform in response to the mass shooting on Friday. Jon Macdonald, the company's CEO, said in a statement that the platform "has listened to public sentiment" after Friday's terrorist attack in Christchurch and will "remove all semi-automatic firearms sales and parts associated with those weapons today" until further direction from the government. New Zealand politicians are holding a cabinet meeting Monday to discuss and outline a ban on military-style semiautomatic weapons, a day after the country's prime minister vowed to enact tighter gun control laws. The suspected shooter had used five guns, including semiautomatic weapons and shotguns, prime minister Jacinda Ardern said. "We’ve had a lot of contact from Kiwis over the weekend about this issue, and many felt that we should stop the sale of these items in the wake of this attack," Macdonald said. "We’ve listened to these sentiments and we’ve put this ban in place while we await clear direction from the government." I have no words to describe my feelings after Friday. Heartbroken, frightened, disgusted are just a few. My worst fear is looking after kids in a lockdown. But I work in a pretty special school - don’t we look amazing? Search warrants were executed at a property in Sandy Beach near Coffs Harbour and Lawrence near Maclean on Monday morning. “The primary aim of the activity is to formally obtain material that may assist New Zealand Police in their ongoing investigation,” police said. “They can’t put his soul into peace because he’s still out there and he’s not buried yet,” 20-year-old Harry Khan told BuzzFeed News. Khan’s uncle, Matiullah Safi, was among those killed in the Al Noor mosque on Friday. Khan had planned to go to the mosque for prayers as well, but got caught up writing an essay at his university’s library. It was not until Saturday night that Khan’s family found out Safi was dead. While they waited for news, his uncle’s son was watching the video of the shooting, saying “This is my dad, he got shot in the head”. Now they are waiting for Safi’s body to be released. In Islam, bodies are usually buried within 24 hours. Until they can proceed with the burial, his family is in a “helpless place”, said Khan. Family members of the alleged gunman say they're shocked and "gobsmacked" that police say he's responsible for killing 50 people and injuring dozens more in a long-orchestrated, white supremacist-inspired terror attack. New Zealand authorities have charged the suspect, Brenton Tarrant, with murder. His grandmother, Marie Fitzgerald, told Australia's Nine News that there had been no red flags that the 28-year-old was becoming a far-right extremist when she saw him last year. His other grandmother, Joyce Tarrant, issued a similar statement, telling the Daily Mail that she saw him over Christmas. However, both women said that their grandson changed after his father died in 2010 and he spent time traveling in Europe. "It’s only since he travelled overseas I think that this boy has changed completely to the boy we knew," Fitzgerald said. Over the past few years, the alleged gunman spent time in Bulgaria, Turkey, and Croatia, authorities said, visiting historical sites and touring dozens of cities. In high school, Fitzgerald said her grandson was not really interested in girls, but spent most of his time on computers and "learning all the internet of computers and playing games on computers." His family say they are heartbroken and "devastated" for the victims, their families, and for the people of New Zealand, calling his acts "irreparable." “We are so sorry for the families for the dead and the injured. I can’t think nothing else just shattered is the word," his uncle, Terry Fitzgerald, told Nine News. The suspect's mother and sister are currently in hiding under the protection of police, the outlet reported. The floral tribute in the centre of Christchurch keeps growing larger and larger. Many people out tonight paying their respects. This stretches on for over 100 metres — the main memorial site at Christchurch’s Royal Botanic Gardens. Lots of people here this evening, lighting candles or just standing and looking at the flowers and cards. Presser now on victim ID process in Christchurch: More than 70 disaster victim identification officers have been working to ID and return the victims to their families. In the past hour, another 20 officers have arrived from other parts of NZ. At a press conference in Christchurch on Sunday afternoon Marshall and deputy police commissioner Wally Haumaha confirmed the ages of the dead ranged from three to 77, and said two children had died. Marshall said authorities were following an internationally approved victim identification process that included each body undergoing a CT scan, having fingerprints taken, clothing and property removed and photographed, dental records examined and a post-mortem. "It is to make sure that we are sure of the identity of a deceased person. There could be nothing worse than giving the wrong body to the wrong family," Marshall said. Several people have told BuzzFeed News the families of attack victims have been left frustrated by the lack of the information and distressed at not being able to bury their deceased loved one within 24 hours, per Islamic custom. Haumaha said authorities had met with Muslim community leaders to explain in full the reasons for the delays. He also said premises had been made available for burial customs such as washing and shrouding the body to take place. So they posted on their business’s Facebook page this morning, asking their customers to drop donations at the hairdresser. Three hours after the Facebook post, Brown told BuzzFeed News that three cars and van had already made seven trips ferrying the constant sea of donations to the families. "We continue to work around the clock to remove violating content using a combination of technology and people,” Mia Garlick from Facebook New Zealand said. New Zealand prime minister Jacinda Ardern has said the bodies of the victims will be returned to their families by Wednesday. A small number will start to be returned this evening. In the press conference on Sunday afternoon, Ardern also revealed her office had received the gunman's "manifesto" nine minutes before the attacks began. The prime minister said it did not mention locations or details, adding that it went to over 30 emails, including the media. Parliamentary security were informed within two minutes of the document being received. She reiterated that the country's gun laws "will change". "There will be changes to our gun laws" that will be discussed in Cabinet on Monday, the PM declared. Elayyan was praying at Masjid Al Noor when he was shot. He has been confirmed by his family to be in the 50 people killed in Christchurch, the football association said. Josh Margetts, from New Zealand football, said: “Atta was a great man and well-liked by everyone in the Futsal Whites squad and the futsal community. “There are no words to sum up how we are all feeling. There is huge hole in our hearts as we come to terms with the loss of a great person and a good mate. Abdul Aziz saw a man in military-style gear, a helmet and carrying a large gun outside the mosque just before 2pm, AP reported. The 48-year-old initially thought the man was from the military but then noticed two bodies and heard the gunman shouting obscenities. Aziz said he ran outside hoping to distract the gunman. When the man returned to his car to get another gun, Aziz threw a credit card machine at him. When the gunman returned and opened fire, Aziz said he weaved between cars to avoid him. Later, after the gunman returned to his car once more, Aziz threw a shotgun he had found on the ground through the vehicle’s window, smashing it, and causing the man to drive off. The mosque's acting imam Latef Alabi said the death toll would have been far higher if it hadn't been for Aziz's actions, AP reported. “My only concern was to help other people,” Aziz said. Identification of victims: Police is working closely and extensively with partners to identify the injured and deceased victims of the Christchurch attack. This is detailed and complex work that must be completed thoroughly. The search of a property in Somerville Street, Dunedin, has now completed. A number of items of interest were located however no items that would present harm to members of the public were discovered. A picture of a man holding a sign of support outside a mosque in Manchester, England, has been shared thousands of times online. Speaking to the BBC afterwards, he said: “There are two ways you can respond to an attack like this – you can respond with fear or you can respond with friendship”. He said people entering the Medina Mosque "beamed and smiled" when they saw his message. The death toll from Friday's mosque shootings in Christchurch has risen to 50 as officers discovered another body in one of the mosques, Mike Bush, New Zealand police commissioner, told reporters on Sunday morning local time. Fifty people were also injured, he said, with 36 of those remaining in Christchurch Hospital, "where they are being treated with the utmost care and professionalism by medical staff." Of those injured two remain in critical condition, Bush said. He added that there is one child among the injured who is receiving care at Starship Hospital. The 28-year-old Australian man arrested and charged with murder is the only person authorities have connected to the attack, he said. Police had arrested another pair after the attack, but Bush said Sunday that the woman arrested had been released without charge, while the man was facing weapons charges unrelated to the attack. Families affected by the tragedy have been notified with a list of names of the deceased. "That list was compiled as a result of work done with victims and with senior religious leaders and was done to give some certainty to victims families," Bush said. He added that it wasn't a "formal list" and that authorities would be unable to share exact details of victims until they have been formally identified. The commissioner said that security around mosques in New Zealand would continue "until we believe there is no threat." In the immediate aftermath of the mosque attacks, 25-year-old artist Ruby Jones, who lives in Wellington, told BuzzFeed News she wanted to do something to capture how her country was feeling. "It felt like the only thing I could do in that moment was put a tiny speckle of warmth out there for anyone who needed it," she said. "A hug, although small, is a symbol of love and togetherness and warmth." The simple illustration has now gone viral, being shared by thousands of people on Instagram and Twitter, including by Thor: Ragnorak director, Taika Waititi, who is also from New Zealand. "My heart is broken. My country is weeping and so am I. I hate knowing this can happen in my homeland. All my love goes out to Christchurch, the victims, the families, the Muslim community, and all who have chosen our beautiful islands as their home. This is not us,” he wrote in his caption. On Saturday night, Kiore, a homeless man who has lived on the streets of Christchurch since 2010, lit 49 candles outside the Christchurch Hospital, one for each person who was murdered as they prayed in city mosques on Friday afternoon. "I got a call this morning at 6 o’clock, just packed my bags and I was here at about 9 o’clock," he said. Read more: Muslims Are Travelling From All Over New Zealand To Support Christchurch Victims. Our hearts go out to everyone affected by the tragic events in Christchurch. Photo by Craig Greenhill. 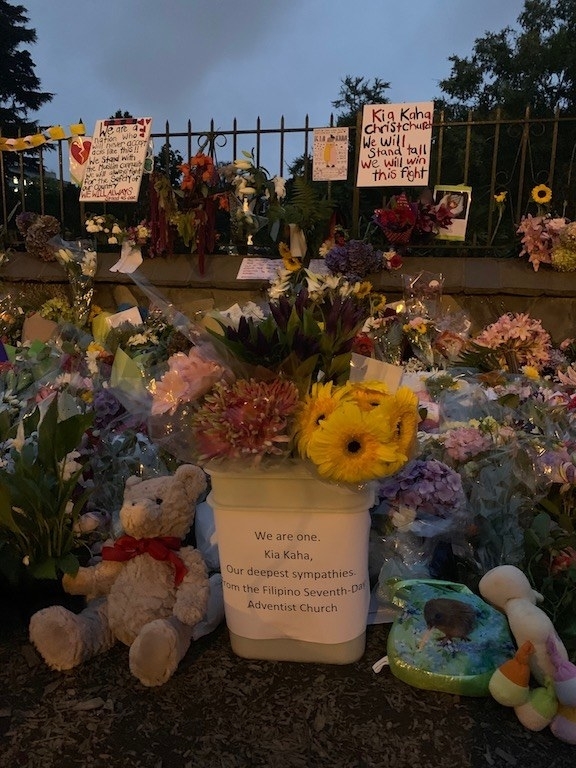 As dusk fell over the New Zealand city of Christchurch on Saturday, people laid flowers at roadblocks near the two mosques where the country's worst mass shooting since 1943 had unfolded. Forty-nine people were killed as they attended Friday prayers. At the juncture of Riccarton Road and Deans Avenue, a growing pile of flowers sat under a street post. Police tape and several officers sealed off access to the Al Noor mosque, a few hundreds metres down the road, where 41 people were killed. A smaller pile had amassed at a roadblock near the Linwood Islamic Centre, where seven people were gunned down. Another person has died in hospital. Between the two mosques, more people gathered at Christchurch's Royal Botanic Gardens. Peaceful messages were chalked onto the pavement – like "united we stand" and "you are loved." The scent of flowers wafted as they mounted up along a fence. At the Deans Avenue gathering, a steady stream of people came to lay flowers and look on silently for a few minutes, many with tears in their eyes. Eskindr, an Ethiopian man who has lived in Christchurch for 17 years, stood with three friends, quietly watching the pile of flowers grow. "We are Ethiopian Christians," he told BuzzFeed News. "But it doesn’t matter whatever you believe, it’s yours. It’s a free county, everyone can believe whatever they want. This is not fair, at all." He said he never imagined something like this would happen in Christchurch. "We just came here to respect those who lost their lives. It can be me, or anyone," he said. "We should be together. The bond has to be strong enough so hopefully we can defeat this kind of act." Ashif ran to the area used for washing before prayer. Shots came through the wall, the wooden shrapnel grazing his arm. He saw two people escape from a window, and tried to do the same but then heard more shoots ring out. He hid with other men, saying prayers, until they heard it was all clear. Police would like to hear from anybody who may have seen, heard or have any information on the Christchurch attacks of 15 March. People with information that can help the investigation can now use a dedicated form on the NZ Police website. This form can be used to submit information, photos and/or documents. You can also use the form to tell us if you have video footage, which can be submitted separately. Our school had three current students on excused leave from school to attend Friday Prayers at the main mosque. We are aware that two of these students are missing, and the other is in hospital with a wound. A past pupil of our school was also at the mosque and is also missing. Daoud Nabi was humble and "one of the kindest people you've ever met," a friend said. The 71-year-old often went to the airport to greet refugees, helping them start new lives in a country he, too, had made his home. He was an engineer and ran his community's Afghan Association. Nabi died Friday afternoon trying to shield another worshiper as a gunman burst into the Al Noor mosque in Christchurch, New Zealand, opening fire during prayer services, his son, Omar Nabi, told local media. Omar Nabi's father was one of 49 people killed during a rampage at two mosques in what New Zealand officials have called a right-wing, extremist terrorist attack and one of the deadliest mass shootings in the country's history. The caption reads: "A reminder that if you need to speak to someone, or if you are feeling distressed, you can call or text 1737. There are extra staff available. That number is available to everyone. "If you are trying to locate loved ones, you can call 0800 115 019 to register missing persons if you are in New Zealand, or visit the website Restoring Family Links - https://familylinks.icrc.org/new-zealand/"
According to the New Zealand Herald, a crowd at a vigil in Aotea Square cheered loudly at the news. The reported remarks follow prime minister Jacinda Ardern’s announcement this morning that the country’s gun laws would change in the wake of the Christchurch attacks. A bouquet of flowers is placed near Christchurch Hospital. Thirty-nine people who were injured in the mosque attacks were still being treated at Christchurch Hospital Saturday afternoon. Greg Robertson, chief of surgery at the hospital, told reporters that 11 of those patients were in critical condition. Of the 48 victims initially admitted to the hospital, seven have been discharged and one patient, a 4-year-old girl, was transferred to Starship Hospital in Auckland, Robertson said. One patient, a middle-aged man, died at the hospital. The injured range in age from the very young to elderly. Their gunshot wounds vary from what Robertson described as "superficial soft tissue injuries" to more complex wounds involving the chest, abdomen, pelvis, and head. "Many of the people will require multiple trips to [operating] theater to deal with the complex series of injuries that they have," he said. Robertson said that while the hospital has had experience with mass casualty events, like in the 2010 Canterbury earthquake, staff were "stunned" by the terror attack. "It's hard to imagine that this could happen in Christchurch," he said. She has said 39 people remain in hospital, with 11 in intensive care. The victims range from children to the elderly. “[It is] clear that young people have been caught up in this horrific attack," Jacinda Ardern said. The prime minister said the accused was in custody within 36 minutes of the first emergency call. Ardern said the suspect had sporadically visited New Zealand, “but spent periods of time here when he visited”. Satellite TV provider Sky New Zealand has removed Sky News Australia from its platform after the channel broadcast video apparently shot by the gunman who opened fire on two Christchurch mosques, leaving 49 people dead. People around the world are leaving bouquets outside their local mosques. A heap of flowers were left outside our mosque in Palmerston North and cops are guarding the place with guns. Thank you for your support 💜 pls stay safe. 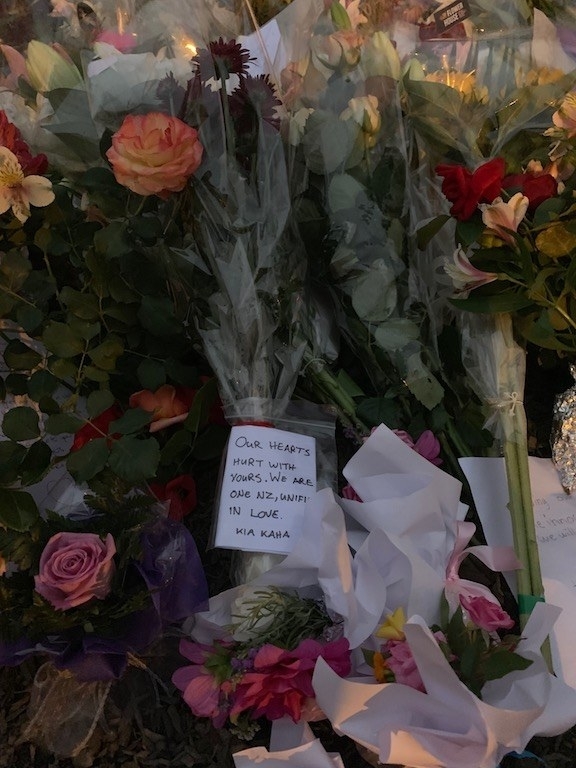 Flowers have been left at mosques around New Zealand but also in Australia, across the United Kingdom, in the United States, and in Norway. The man charged over the Christchurch mosque shootings has appeared in court where he did not apply for bail or for the suppression of his name, ABC has reported. Brenton Harrison Tarrant, 28, briefly appeared at Christchurch District Court on Saturday morning. "While the man is currently facing only one charge, further charges will be laid," New Zealand Police tweeted earlier on Saturday morning. "Details of those charges will be communicated at the earliest possible opportunity." Tarrant was handcuffed and not required to speak. After he left the courtroom, the judge said that while “there is one charge of murder brought at the moment, it is reasonable to assume that there will be others", AP reported. He has been remanded in custody until April 5. A survivor of the Christchurch mosque shootings recounted how he continued to pray after hearing gunshots outside the Linwood Ave mosque. "We kept praying for the first two or three shots," Syed Ahmed, who was in the front row of the mosque, told BuzzFeed News on Saturday morning. "Then suddenly he came towards the main door. People started screaming and everybody got out of the prayer." President Trump said Friday he doesn't view white nationalism as a growing threat after the deadly terror attack in New Zealand that left 49 people dead was carried out by a white supremacist gunman who left behind a racist manifesto calling his victims "invaders." "I don't really," Trump said from the Oval Office after being asked by a reporter. "I think it's a small group of people that have very, very serious problems, I guess." "While the man is currently facing only one charge, further charges will be laid," New Zealand Police said. "Details of those charges will be communicated at the earliest possible opportunity." New Zealand's police commissioner Mike Bush is travelling to Christchurch on Saturday morning where he will speak to the media, accompanied by the Canterbury District Commander and "other local emergency service leaders". The day after more than 40 were killed in mass shootings at two mosques in New Zealand in one of the worst mass shootings in the nation's history, the country's prime minister vowed to strengthen the country's gun laws. "I can tell you one thing right now: our gun laws will change," Prime Minister Jacinda Ardern said during a press conference Saturday morning. "Now is the time for change." Christchurch mayor Lianne Dalziel vowed to rebuild and support the Muslim community in her city, promising to help the victims and survivors bury their friends and loved ones. "They are our friends and they are our neighbors and we embrace them," she told reporters in a press conference on Saturday morning local time. "We want to come together to support them and give them the time and space they need to deal with the immediate issues at hand. We still have injured people in the hospital." The mayor said city officials had already started gathering funds and resources to begin the unprecedented undertaking of burying the 49 worshipers. The coroner is still identifying the bodies and the mayor said she did not have any immediate information as to when they will be released. "We have a large number of funerals," she said, "and there are specific requirements for Muslim funerals and we are working closely with the community to make sure we have the appropriate spaces for these ceremonies and graves." "Graves are being dug today," she added. Echoing other leaders in New Zealand, Dalziel expressed shock and "revulsion" that her "safe city" is the latest to mourn a massive terrorist attack. "This sort of extremism is something we have not seen before," she said, but she reiterated that the gunman "is not from here" and "did not develop this hatred here." "His voice was the voice of hate and I will not give voice to it," she said. President Trump spoke with New Zealand Prime Minister Jacinda Ardern Friday, a day after a deadly attack targeting Christchurch mosques left 49 people dead. "I informed the Prime Minister that we stand in solidarity with New Zealand – and that any assistance the U.S.A. can give, we stand ready to help," Trump said in a series of tweets Friday afternoon. Trump's call to the prime minister came after the White House issued a statement condemning the mass shooting. In an early morning tweet, the president also offered his "warmest sympathy and best wishes" to the people of New Zealand. Islamic community leaders in the US urged American Muslims not to be afraid of attending Friday’s weekly prayers after the attack in New Zealand. “Millions of Muslims will be in mosques in the next couple of hours, concerned and fearful of their lives,” Nihad Awad, the founder of the Council on American–Islamic Relations (CAIR), said during a press conference on Friday. “They are being told to be afraid by white supremacists and political leaders who believe in white supremacy. We tell our community, do not be afraid and do not abandon your mosques. Not today. Not ever,” Awad said. Along with other civil rights leaders, CAIR’s members condemned the terrorist attack and called for unity and solidarity with all minorities. They also urged the Trump administration to push back against growing anti-Muslim and anti-immigrant sentiments in the country and around the world. CAIR members referred to the alleged attacker’s racist manifesto where he mentioned Trump and called the victim’s “invaders” — anti-immigrant rhetoric that has been echoed by some conservative media outlets and the Trump administration to describe immigrants at the US border. Jill Keats, a 66-year-old woman who helped treat an injured victim during the shooting and called his wife for him, is being hailed as a hero for her actions. Keats was driving down Deans Avenue to go to the mall when she heard what she thought were firecrackers and saw young men running down the street, Newshub, a New Zealand news outlet, reported. "[But] all of a sudden it got quite violent, and I thought, That's not firecrackers — and they just started falling," Keats told Newshub. "One fell to the left of my car and one fell to the right." Keats said she stopped her car in shock and leaned over her seats to avoid the bullets. She saw that one of the men who was lying near her car had been shot in the back. She then opened her car doors and, with the help of another driver behind her, put the injured victim in the back of her car to protect him from the gunfire. The other driver went to get a first aid kit from his car, and they both began dressing the victim's wound. Keats said she was shaking so hard that a "nice Muslim guy came up and gave me some help" to compress the victim's wound. "The guy I was compressing, he was trying to ring his wife and I managed to get it and answer the phone and I said, 'Your husband's been shot outside the mosque. Don't come here to Deans Ave, you won't get through — but please go to a hospital and wait for him,'" Keats recalled. "Then I kept talking to him and telling him that she was at the hospital waiting and he wasn't to give up," Keats said. Keats and the other driver held pressure on him until help arrived. She said that another victim who had fallen across the road had died while she was helping the injured man. "I couldn't get to him because that was where the gunfire was coming from," Keats said. When the Newshub anchor commended her actions and called her a hero, Keats shook her head and said, "No, I'm not. You just do what you do at the time. I wish I could've done more." "I'm 66," Keats said, breaking down after describing the devastating scene. "I never thought in my life I would see something like this. Not in New Zealand." “The United States strongly condemns the attack in Christchurch," press secretary Sarah Sanders said. "Our thoughts and prayers are with the victims and their families. President Donald Trump subsequently tweeted his condolences. The New Zealand national flag is flown at half-mast on a Parliament building in Wellington. In a statement, Queen Elizabeth II said she was "deeply saddened by the appalling events in Christchurch." New Zealand is part of the Commonwealth and the Queen is the country's formal head of state. French President Emmanuel Macron also condemned the attack and said France stood against all forms of extremism. European Council President Donald Tusk said Europe's thoughts were with the victims and their families. New Zealand Prime Minister Jacinda Ardern "can count on our solidarity," he wrote. Earlier, Australian Prime Minister Scott Morrison and UK Prime Minister Theresa May condemned the attack and said their thoughts were with all those affected by the violence. Pakistan Prime Minister Imran Khan condemned the attack. "This reaffirms what we have always maintained: that terrorism does not have a religion," he wrote on Twitter. "Prayers go to the victims and their families." Police are "in attendance" at a property in Dunedin after 49 people were killed in shootings at two mosques in Christchurch on Friday. 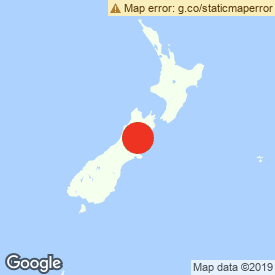 "This is a location of interest in relation to the serious firearms incident in Christchurch today," they said on Twitter. Dunedin is around 200 miles south of Christchurch. The property is on Somerville Street, to the east of the city. Forty-one people died at the Deans Avenue mosque and seven at the Linwood mosque, Bush said in a press conference. Of the 40 people treated at the Christchurch Hospital, one has died. A man in his late twenties has been charged with murder and will appear in court on Saturday morning, Bush said. A further three people are in custody. Two of them were apprehended in possession of firearms. Another person was armed and at the scene, but police believe they "may have had nothing to do with this incident," Bush said. Bush said that police had recovered a number of firearms from both mosques. Asked whether the man charged had explosives on his body, Bush said: "What I can say is that that person may have suggested that. We've eliminated that as a possibility. There was not." Armed officers will be present around all of New Zealand's mosques "to ensure nothing further occurs", Bush said, but confirmed that there had been no further threats. Earlier police had suggested there were IED devices on two vehicles. "I'd like to clarify that and say there were possibly two IEDs on one vehicle," Bush said. Police have disabled one and are in the process of disabling the other, with the assistance of the defence force. Bush also confirmed that two bags that police investigated in Auckland did not pose a threat. David Meates, chief executive of the Canterbury District Health Board, said the injuries range from critical to minor. He said additional patients with gunshot wounds presented to other health facilities. British Home Secretary Sajid Javid has said the UK stands "with New Zealand and Muslims across the world against all forms of racism and anti-muslim hatred"
Morrison speaking at Kirribilli House in Sydney. "As family members with our New Zealand cousins, today we grieve, we are shocked, we are appalled, we are outraged, and we stand here and condemn absolutely the attack that occurred today by an extremist, right-wing, violent terrorist that has taken the lives, stolen the lives, in a vicious, murderous attack, that has claimed so many New Zealanders." Ardern said 10 people died at the Linwood Avenue mosque and a further 30 died at the Deans Avenue mosque. Another 20 are seriously injured and in Christchurch Hospital. Ardern said she did not have information on the ages of the victims, but said there was a range and they would have been "brothers, fathers, sons". "It is clear that this can now only be described as a terrorist attack," Ardern said. "From what we know, it does appear to have been well planned. Two explosive devices attached to suspect vehicles have now been found and they have been disarmed." Intelligence agencies, police, and the defence force are all involved in the response, and the national security threat has been lifted from low to high, Ardern said. "There are currently four individuals that have been apprehended, but three are connected to this attack who are currently in custody. One of which has publicly stated that they were Australian-born," Ardern said. "These are people who I would describe as having extremist views, that have absolutely no place in New Zealand, and in fact have no place in the world." Ardern said she has been advised the people in custody were not on security watch lists. Asked why not, she said, "It is an indication ... that they had not acted in a way that warranted it." She said every New Zealander would be shocked by the attack, adding, "This is not who we are." "We have undoubtedly experienced an attack today that is unprecedented, unlike anything we have experienced before. But, as I say, New Zealand has been chosen because we are not a place where violent extremism exists. We reject those notions and we must continue to reject them." He said that fact will led to Australian investigation as well, which will be shared with the New Zealand authorities. "Christchurch, we stand with you during this time. Our thoughts and sympathies are with everyone affected by today's tragedy. Stay strong. Kia Kaha. 🖤‬"
Representatives from Facebook, Twitter, and YouTube said they have suspended the accounts of a suspected gunman and are working to remove all versions of a video of the shooting from their platforms. Mia Garlick, a spokesperson for Facebook New Zealand, said in a statement that police alerted the company to the video that the gunman appears to have live-streamed of the shooting soon after the incident began. "Our hearts go out to the victims, their families and the community affected by this horrendous act. New Zealand Police alerted us to a video on Facebook shortly after the livestream commenced and we removed both the shooter’s Facebook account and the video." Garlick added that they are also working to remove "any praise or support for the crime and the shooter or shooters." A spokesperson for YouTube said in a statement, "Shocking, violent and graphic content has no place on our platforms, and is removed as soon as we become aware of it." Facebook also said they had taken down the suspected shooter's Instagram account. "We would like to reassure members of the public that there is a large police presence in the city and the safety of the community is our priority," New Zealand police said in a statement. Police had found a number of improvised explosive devices strapped to vehicles, and these have now been secured by the defence force, Bush said. He did not comment on a possible motive, or confirm the shootings were being treated as terrorist attacks. "We're looking at the circumstances that surround that. It doesn't get any more serious," Bush said. He said police are not assuming the situation is isolated to Christchurch. Speaking from inside the locked-down Otago Muslim Association, situated about 350 kilometers south of Christchurch in the coastal town of Dunedin, Haizal Hussaini said he was in disbelief that his organization was once a target mentioned in the alleged shooter's manifesto. Hussaini says the mosque, which serves about 400 Muslims in the community, posted a video in 2012 about the growth of Islam in the US. "It came to my attention that this person reacted to this video and that partly triggered the attack," the 45-year-old said. "My immediate reaction was to delete it so others don't see it." As the shooting unfolded, police descended upon the mosque and have been stationed outside for hours, he said. "It's all so terrible and outrageous," he said. "The community is close and international. We are peaceful and we get along well. This is all so shocking. A loss for words." Hussaini said that police officers and local media had reported that 27 people died in the attack, but officials have not yet confirmed that number. The Otago Muslim Association had a "close, friendly relationship" with the Masjid Al Noor mosque in Christchurch, which serves a larger congregation of Muslims. "I knew everyone there, it seemed," he said. "I feel such sorrow." Due to the ongoing serious firearms incident in Central Christchurch Police would like to remind all parents and caregivers that schools across the city remain in lock down. There is no timeframe at this stage for when the lock down will be lifted. The children are being taken care of by schools. On advice from Police, schools will communicate directly with parents when the lock down is lifted. The safety of the community is our priority. Media please note the stand up with Commissioner Mike Bush has been pushed back to 5.30pm. This will be held at the Royal Society on Turnbull Street, Thorndon, Wellington. We’re heartbroken over the events in Christchurch today. We stand with our Kiwi friends and neighbors and our prayers are with you. Kia kaha. Christchurch mayor Lianne Dalziel speaking on @CheckpointRNZ: "This is not something I would ever expect to see in this city and it's not something I would ever expect to see in New Zealand." Anna Christensen, a 14-year-old taking part in the climate strike in Christchurch, says protesters only found out what was happening at the mosques after a policewoman took the stage and told everyone they need to evacuate immediately. All members of the Bangladesh national cricket team, who were in Christchurch for an upcoming match, escaped the deadly shooting at two mosques and the nearby streets. Minutes after shots rang out in the New Zealand city, players from the team tweeted about escaping the violent attack. "We r extremely lucky," one of the players, Mushfiqur Rahim, tweeted. "Never want to see this things happen again...pray for us." Team officials said in a statement that all players had returned to their hotel and were deemed safe after the attack. New Zealand prime minister Jacinda Ardern is now speaking. She said: "This is one of New Zealand's darkest days." "Clearly, what has happened here is an extraordinary and unprecedented act of violence," Ardern said. She confirmed police have one suspect in custody and there are multiple scenes. "Christchurch Hospital is dedicated to treating those who are arriving at the hospital as we speak as well. As soon as I leave here, I will be returning directly on a flight to Wellington. Agencies are already convening in Wellington. I will be looking to meet with them as soon as I land." Asked if she viewed the shooting as a "hate crime", Ardern replied: "I would describe it as an unprecedented act of violence, an act that has absolutely no place in New Zealand. This is not who we are." "Certainly, it has occurred in a place where people should have been expressing their religious freedom. Where they should have been in a safe environment. And they have not been today. "There is no place in New Zealand for such extreme acts of unprecedented violence. The people who were the subject of this attack today, New Zealand is their home. They should be safe here. The person who has perpetuated this violent act against them, they have no place in New Zealand society." New Zealand Police Commissioner Mike Bush said in a live-streamed video statement Friday that there were multiple fatalities after shootings at two mosques in the Christchurch area, adding that one person was in custody. "We are dealing with a very serious and tragic series of events," Bush said in the video posted to Facebook. "We have one person in custody but we are unsure if there are other people." Bush said the fatalities occurred at a mosques on Deans and Linwood Avenues, adding that police were unsure whether any other locations that were "under threat." "Stay indoors if you're in that location," he said. "I want to ask that anyone that was thinking of going to the mosque anywhere in New Zealand today not to go. Close your doors until you hear form us again." The gunman appears to have live-streamed the shooting, filming himself loading several weapons inscribed with names into a silver van and driving to the central Christchurch mosque. Gun drawn, he walks through a gate to the entrance of the mosque and begins firing on people inside. According to the footage, the gunman was live-streaming through a GoPro device and onto Facebook. The nearly 17-minute video was also posted onto YouTube. In the first few minutes, the gunman says, "Remember lads, subscribe to Pewdiepie," a popular meme among the followers of the Swedish YouTuber, who has in the past spewed racial slurs and made anti-Semitic comments on his channel. A Twitter account that appeared to be associated with the gunman posted photos of the weapons used in the attack footage. The user also appears to have shared links to a manifesto around the time the shooting began. At more than 74 pages, the document outlines a white supremacist motivation for the attack. The writer, who identifies himself as a 28-year-old white man born in Australia, quotes the so-called "14 Words," the slogan shared by white supremacists worldwide. He said that while he supported white nationalist groups, he alone had decided to carry out the attack. He described the victims as “invaders” and accused them of seeking to replace white people. He wrote about attacking two mosques, one in Linwood and one in Christchurch. He focused on the latter because it was larger, he wrote. The Twitter account only started posting content on March 12, repeatedly sharing white nationalist content about "illegal immigrants." Twice, the user shared a Facebook profile for the Otago Muslim Association, which the manifesto said was the first choice for the attack. In one tweet, the user posted a Daily Mail story about a stabbing attack at a restaurant in Berlin. In response, he wrote, "How many of these attacks are quickly forgotten?" Friday's shooting took place during scheduled prayer at Masjid Al Noor, which regularly draws several hundred people. The mosque was built in 1985 and was the first in Christchurch. Eyewitness Mohan Ibrahim told the New Zealand Herald he was one of hundreds of people in the mosque when shots were heard on Friday afternoon. "At first we thought it was an electric shock but then all these people started running,” he said. "I still have friends inside. I have been calling my friends but there are many I haven't heard from. I am scared for my friends [sic] lives." Len Peneha told AP he saw a man dressed in black enter the mosque and then heard dozens of shots. “I saw dead people everywhere," he said. Peneha said he saw the gunman flee before emergency services arrived. Sky News has reported that hundreds of people were inside the mosque when a gunman opened fire. A serious and evolving situation is occurring in Christchurch with an active shooter. Police are responding with its full capability to manage the situation, but the risk environment remains extremely high. Police recommend that residents across Christchurch remain off the streets and indoors until further notice. Christchurch schools will be locked down until further notice. In a statement, Christchurch police said armed officers had been deployed. "Police urge anyone in central Christchurch to stay indoors and report any suspicious behaviour immediately to 111." The New Zealand Herald has reported the incident occurred at the Al Noor mosque and that there were reports of casualties.